The 65-inch Samsung HU9000 is an event TV, where you invite your friends and family over to watch the World Cup or the Emmys. Actually, no matter the program, this curved Ultra HD 4K beauty of a beast is an event by itself. The picture quality of the 65-inch 4K display with four times the resolution of a normal HDTV is remarkable. Add the novelty of a curved screen and even your most blasé in-laws should be impressed. If your kin still are not swayed, then this top of the line HU9000 series provides plenty of other bells and whistles like voice and motion control. In fact, this Smart TV is overflowing with features, perhaps too many for those who are still puzzled by their smartphones. Luckily, you do not need to futz with all those features to enjoy the HU9000's splendid picture quality. 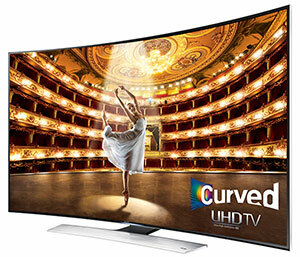 (Editor's Note: Samsung makes three sizes of the HU9000 series of Curved LED UHD TVs, this 65-inch and its 78 and 55-inch siblings. Since the three models possess similar specifications, this review can apply to all of them. The video performance of the Samsung HU9000 is excellent. For all but the most discerning, you simply pick your favorite picture mode and sit back and enjoy the consistently outstanding picture quality. The pair of integrated 10W woofers gives the audio quality a needed boost in the lower range..
With the HU9000 series, think everything including the kitchen sink. If it's available, Samsung has incorporated it, not one but two remotes, built-in Wi-Fi, apps galore, voice recognition, 3D, Bluetooth, screen mirroring, smart view, MHL and ARC support, even an integrated video camera for Skyping and controlling the TV by hand motions - and the list goes on. With so many features, the 65HU9000 offers a two pronged user experience. The quick and painless initial setup results in an extremely watchable outcome. Now, if you wish to explore all of the extras like motion and voice control, expect to set aside study time. At a suggested retail price of $6000, the 65-inch HU9000 UHD TV is downright expensive. But Samsung is aware of the competition heating up the Ultra HD marketplace and as I write this, they are offering this feature rich TV for $4300, which includes a bonus HW-H450 sound bar and UHD Video Pack through 9/20/14. For even a better bargain, if you can do without the curve, Samsung's 65-inch flat panel HU8550 UHD TV is on sale for $3200 with the bonus UHD Video Pack. Ratings are relative to when the review was written. The obvious example is Value, what you could purchase for $2000 two years ago or even two months ago would seem like a bad value for that price now. We give very few 5 Star ratings, which we reserve for truly outstanding accomplishment.